A winter annual (or very seldom a summer annual) that resembles some of the pepperweeds when mature. 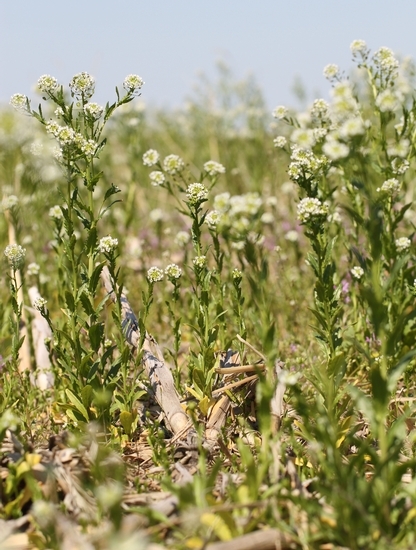 Field pennycress is primarily a weed of winter small grains, nurseries, and horticultural crops that is found throughout the United States. 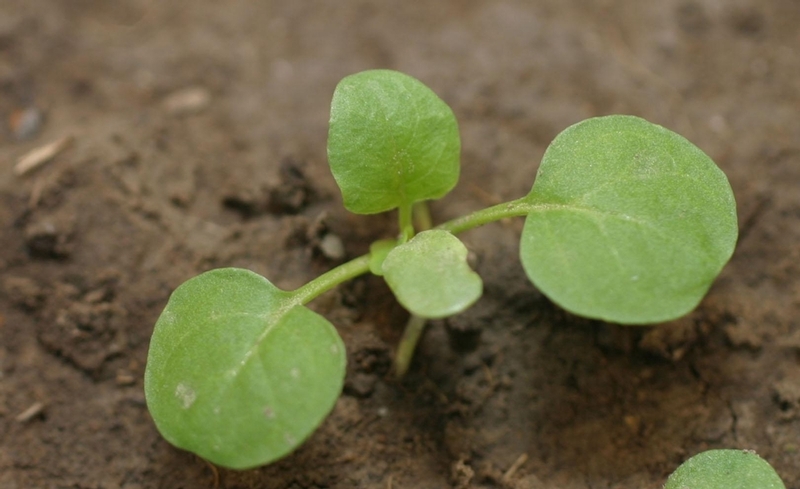 Cotyledons are oval to oblong in outline and occur on long (5-7 mm) petioles. 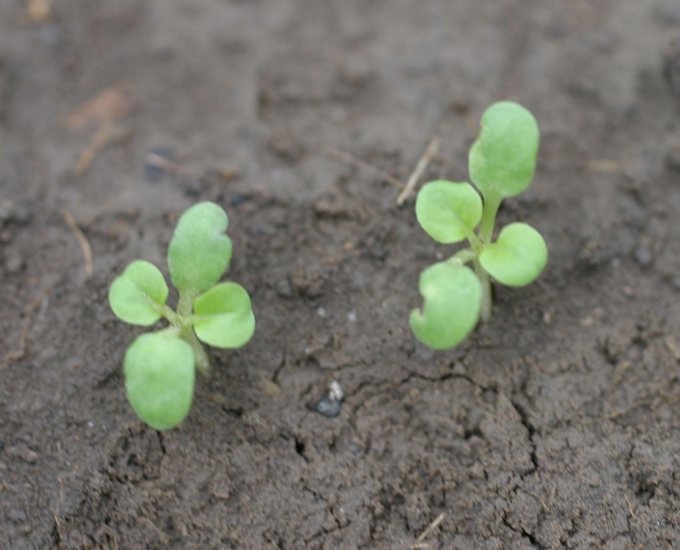 First true leaves also occur on distinct petioles and develop into a basal rosette. Young leaves are without hairs, round to oval in outline, with a distinct white midvein and wavy margin. Leaves initially develop into a basal rosette and are without hairs, oval in outline, with a wavy margin. 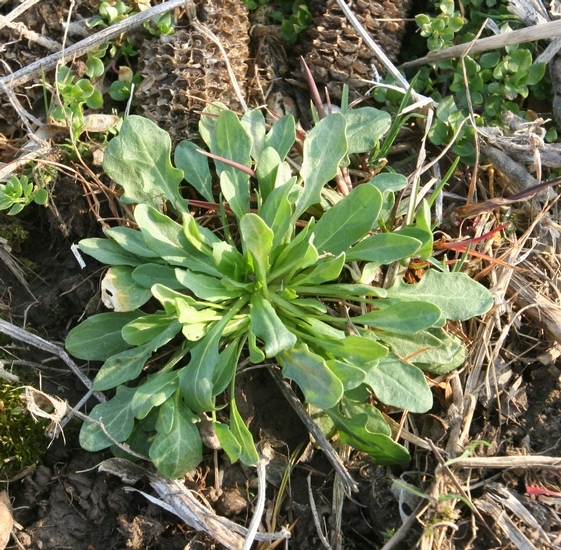 Leaves along the flowering stem are generally much different than those of the basal rosette. 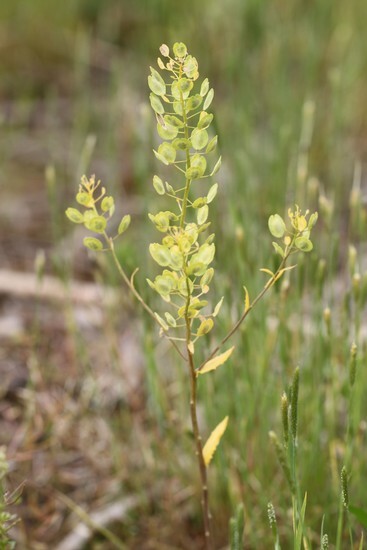 Leaves along the flowering stem are more lanceolate in outline, without petioles (sessile), usually have toothed margins, and have pointed lobes that clasp the stem at the base of the leaf. Erect, ranging from 4 to 24 inches in height, usually branching in the upper portions only. Stems are without hairs and the leaves usually fall off the stems as the plants reach maturity. Individual flowers are very small (4-6 mm) and occur in clusters at the ends of the bottle-brush stems. 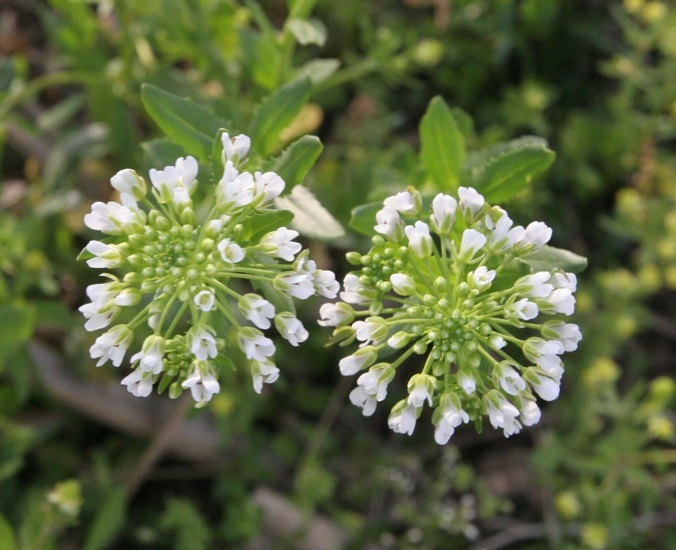 Flowers consist of 4 white petals and 4 green sepals. Many winged silicles give mature plants the distinctive bottle-brush appearance, similar to many of the pepperweeds. Each silicle is circular in outline, approximately 1/2 inch in diameter, relatively flat, and distinctly winged along the outer margins. 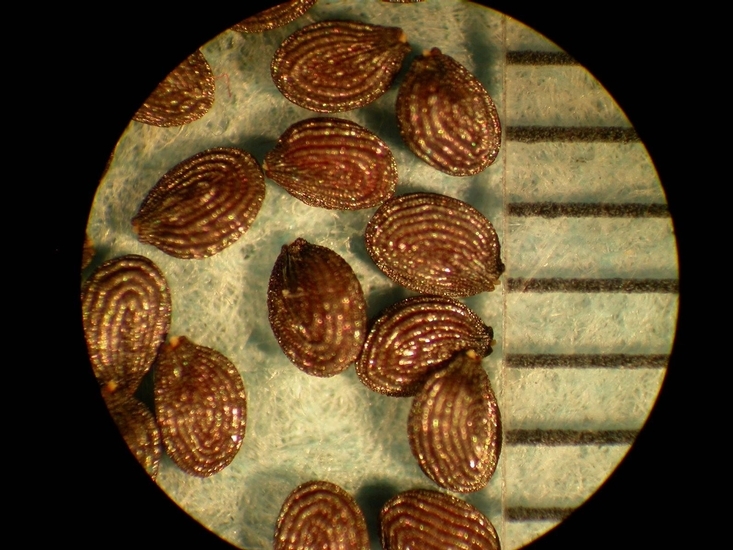 Silicles divide in half and may contain as many as 16 seed per silicle. A taproot and smaller fibrous root system. 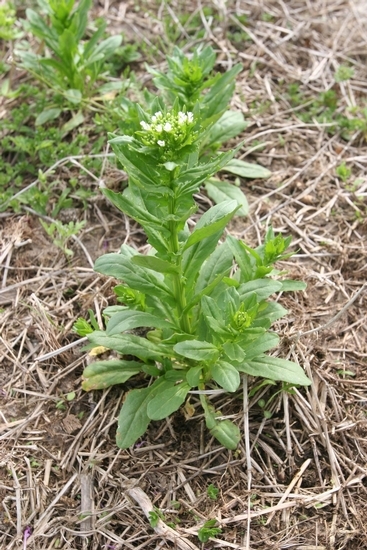 The oval, hairless leaves of the basal rosette and leaves with pointed lobes that clasp the flowering stem are both characteristics that help in the identification of field pennycress. Additionally, the bottle-brush appearance of the seedhead helps to distinguish this weed from many other winter annuals. 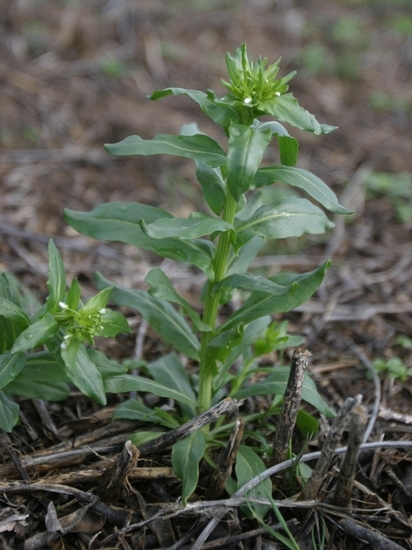 Thoroughwort or Perfoliate Pennycress(Thlaspi perfoliatum) is similar but has fruit that are more distinctly notched and heart-shaped in appearance. 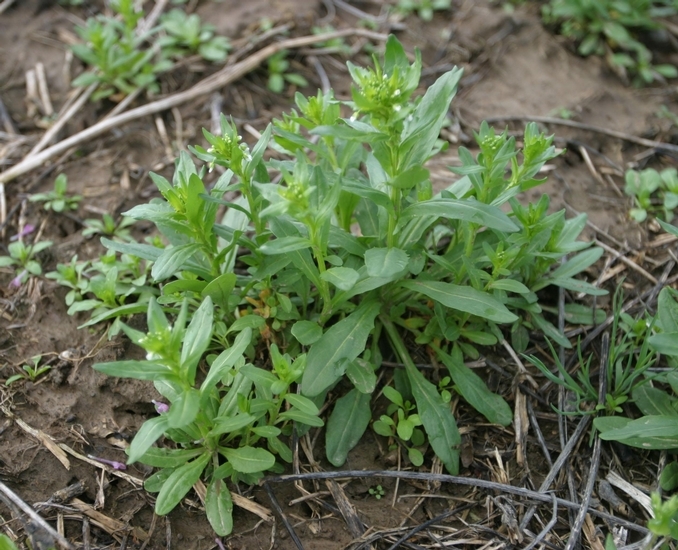 Field Pepperweed (Lepidium campestre) is also similar to field pennycress but has leaves with short hairs and more rounded fruit than those of field pennycress.